Whether you have big brakes or an intricate design on your wheels, this brush will help rid your vehicle of brake dust. Its non-slip comfort grip and scratch-free bristles help to gently loosen brake dust and dirt. The bristles are made of soft polypropylene which is thinner and therefore softer than nylon bristles. While brake dust can be stubborn, it doesnt take a rough brush to remove it. It just takes some agitation with a soft brush to loosen the brake dust so it rinses away easily. The Mothers Brake Dust Brush has a lightweight design to help make tedious work easy. Description Whether you have big brakes or an intricate design on your wheels, this brush will help rid your vehicle of brake dust. Its non-slip comfort grip and scratch-free bristles help to gently loosen brake dust and dirt. The bristles are made of soft polypropylene which is thinner and therefore softer than nylon bristles. While brake dust can be stubborn, it doesnt take a rough brush to remove it. It just takes some agitation with a soft brush to loosen the brake dust so it rinses away easily. Adjust the width of the brush by pulling apart the two wires that make up the brush head. The brush can be adjusted to accomodate spoke widths of any size. 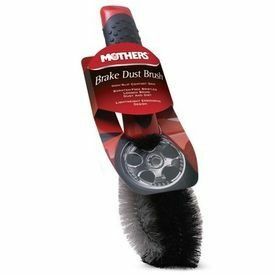 The Mothers Brake Dust Brush has a lightweight design to help make tedious work easy.